I haven’t met a single gal who doesn’t love flowers; so if you like making candles, I’m pretty sure you’ll also love this spring-inspired DIY. There’s nothing like some fresh flowers to get you into the mood for spring—even if the weather isn’t necessarily cooperating where you are. 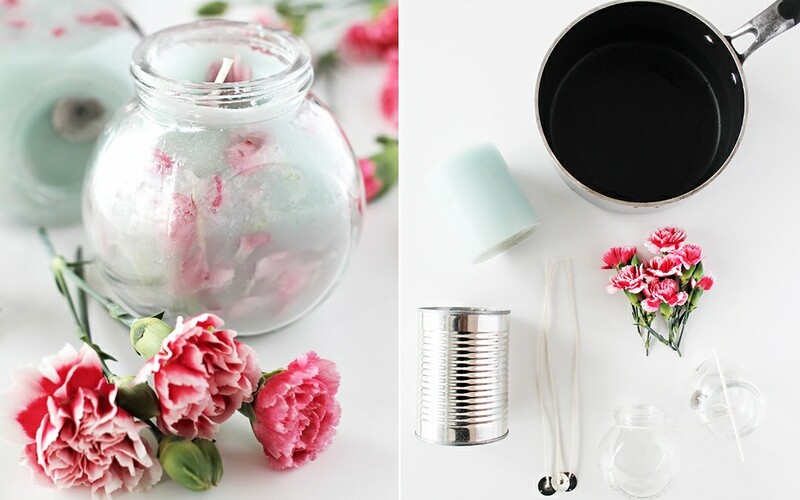 This lovely DIY flower-petal candle will surely brighten your space. It’s customizable, too: Simply pick up your favorite bouquet and, with just a few petals, give an old candle a bright new life! Melt the wax (scraped from an old candle or purchased) via a double boiler, or by putting it in a can placed into a pot with 2 inches of water. Turn the heat to medium and wait until the wax has completely melted. Optional: Use a few drops of essential oil to add scents. Place the wick in the center of the jar and loop it around a stick or pencil so that it holds in place. With a brush, press the petals onto the edges of the jar, using a little bit of wax. Carefully pour the melted wax into the jar and let cool. Trim the wick and enjoy your candle! What DIY projects do you do with old candles?